A few months ago, I signed up to be a recipe tester for cooks illustrated. On Friday, I got my first email with a new recipe to test! Obviously, pork belly was a very appealing dish for me to tackle. The recipe is actually nothing revolutionary for pork belly. The thing that makes it stand out I think is after you roast the belly at low heat for a few hours, you use the fat to fry the skin. I made a lot of bacon for the side dish I served so I also used the fat from that. What you end up with is an amazing mesh of crispness (think chicharrones, YUM) with melt-in-your-mouth fat (very rich, almost like a foie gras like quality). Another good twist this recipe gives is it tells you to serve it precut. I kinda hate it when restaurants give you a slab of pork belly and then you’re left awkwardly trying to cut through skin and fat. Too messy, too frustrating. The recipe gives three sauce choices to serve with the pork- a mustard-based sauce, sweet and sour sauce, or a hoisin-ginger sauce. I went with the last one because I let mark choose which one he wanted. Instead of having people pass around the sauce, I glazed the belly with a spoonful of sauce per serving. 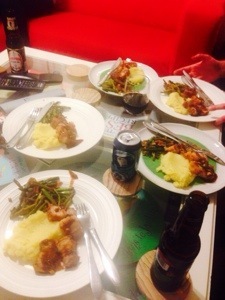 I had the belly pieces sit atop a mound of very puréed mashed potatoes and made the addictive asparagus (so much bacon…) on the side. Pork belly isn’t an expensive cut of meat (relatively) and because of the richness of the dish, you only need a small serving (~4 oz). The dinner attendees were Austin, Patrick, Ashley, Pat, Garrison, Mark, Amanda (who didn’t eat because she doesn’t like pork) and Lindsay baker. I am so bloated from basically eating nothing but fat and carbs coated with sodium yesterday. But it was worth it. This entry was posted in weekend and tagged asparagus, crowd, group, pork, pork belly, potatoes, weekend. Bookmark the permalink.